The UK restaurant market is entering an era of “premiumised informality” with diners increasingly seeking out street food and “gourmet” pub food, according to industry experts. Joan Roca (world’s No.1 chef), Brett Graham at The Ledbury, Albert Adria and James Knappet from Kitchen table, who have nine Michelin stars between them. 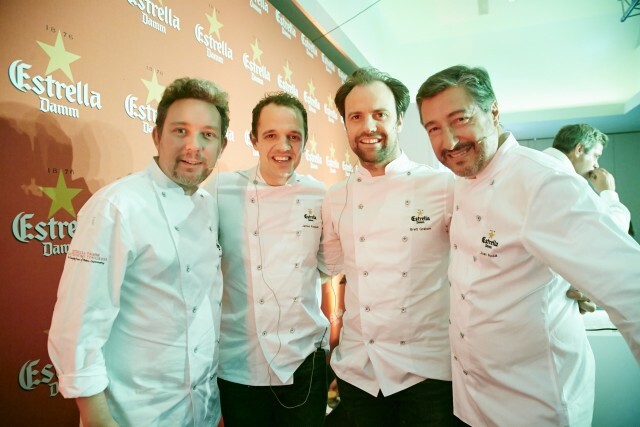 Attended by some of the world’s top chefs, The Estrella Damm Gastronomy Congress was held in London on Tuesday with the aim of exploring the future of fine dining and discussing trends in the UK dining scene. A report commissioned by Estrella Damm revealed that pubs and casual dining restaurants were gaining in popularity, with the modern diner increasingly shunning more formal experiences. Presenting its findings Simon Stenning, of M&C Allegra Foodservice, said that the pub sector was “re-inventing” itself by focusing on a trend for “premiumised informality”, reflecting demand for quality food in a comfortable and reliable environment. Held at The Hurlingham Club in London, the event was attended by some of the world’s finest chefs including Joan Roca of “the world’s best restaurant” El Celler de Can Roca, Albert Adrià of Tickets, Brett Graham of The Ledbury, and James Knappett from Kitchen Table at Bubbledogs. Brett Graham, head chef at The Ledbury, agreed that top end restaurants were having to change in order to provide a slightly more formal approach to service, “whilst maintaining the polish and quality you would expect”. “People want to be comfortable and enjoy their food in a relaxed environment which means stuffy service just isn’t what people want anymore”, he said. Overall, the UK restaurant market has grown by 1.5% in 2015, growing at a rate of 6.2% since 2011, with 16 new pub and casual restaurants opening every week. Looking ahead, street food and all day dining concepts are tipped to become the fastest growing dining options in the next three to five years.